The church of St Peter and St Paul at Exton (Rutland) contains some outstanding monuments. The largest and most spectacular of them is to be found on the east wall of the north transept. This is the monument to Baptist Noel, Third Viscount Campden (c.1612-1683). 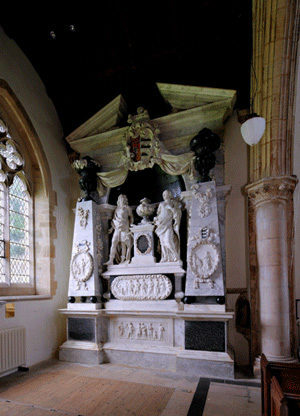 This formidable structure, squeezed in to a space too small to adequately display it, is of white and black marbles and shows the Viscount and his fourth wife, Elizabeth daughter of Montague Bertie, 2nd Earl of Lindsey and his wife Martha. Reliefs on various parts of the monument depict his three other wives and their nineteen children. It was made by Grinling Gibbons, perhaps better known for his carvings in wood. The massive white marble base features a relief showing six of the children, two sons and four daughters along with his third wife Hester Wotton, flanked by inscription plates of black marble. The inscription on the left gives brief biographical information on Baptist, while that on the right gives the names of his children by his four wives. Centrally placed on the base is a sarcophagus with a relief of nine children, three sons, three daughters, and three babies, along with his fourth wife Elizabeth, all surrounded by an oval wreath. Upon this is a pedestal surmounted by an urn and flanked by large standing statues of the Viscount and his fourth wife. On the pedestal is a black marble inscription plate recording that the monument was erected by order of Elizabeth and carried out by her third son, John Noel, in 1686. Flanking the figures are two large truncated pyramids on balled feet surmounted by wreathed urns of black marble and decorated with garlands and two oval wreaths depicting the remaining wives and children. That on the left shows his first wife, Ann Fielding,with three babies while that on the right shows his second wife, Ann Lovet, and one baby. Above the ensemble is an arch supporting an open pediment upon which are draperies and a shield in a cartouche with the arms of the Third Viscount. As was the fashion for the age, all of the figures are depicted in Roman dress. The monument is well-balanced given its size and level of fine detail. The reliefs and garlands are excellent – not surprising given that they are by Gibbons – but the figures, to my mind, are not particularly successful. It cost £1000, the equivalent of over £130,000 today. Baptist Noel was a Member of Parliament for Rutland between 1640 and 1643. He succeeded to the title of 3rd Viscount Campden, 3rd Baron Hicks of Ilmington and 2nd Baron Noel of Ridlington in March 1642/3. During the Civil War he sided with the King and it was during this time that he ordered his house at Chipping Campden (Gloucestershire) to be burnt down so as not to be of use to Parliamentary forces. He was subsequently fined £9000 for his support of the King. Baptist Noel died on the 29th of October 1683. 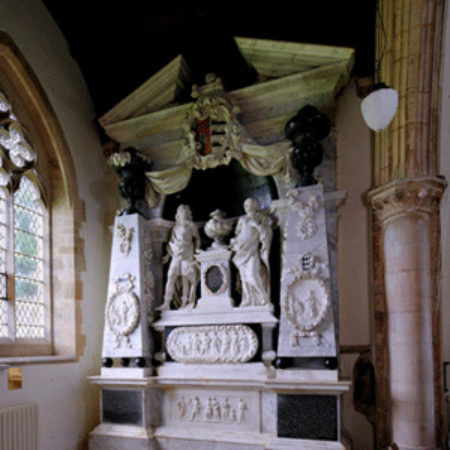 The monuments in Exton church were restored by the Exton Monuments Restoration Fund between 2000 and 2002. The Viscount’s monument cost £49,000 to restore. The work was carried out by the Skillington Workshop of Grantham (Lincolnshire).